On May 5th, Teddy made the journey to the bridge, a victim of old age and extreme pain from arthritis. 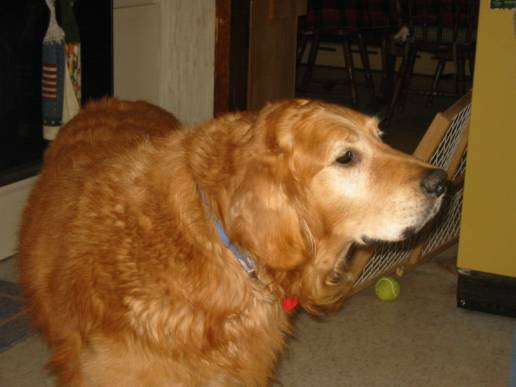 Teddy embodied all the positives of Long Island Golden Retriever Rescue. Found by our president, Melanie, in a municipal shelter in August of 2004, in pain and severely depressed, Teddy had little chance of adoption. He had large tumors on his head and leg, he was very old and surely would incur large veterinary bills. We were told at the shelter, "If he lives through the weekend, you can take him." Undeterred, our volunteers took him to one of our vets where he was bathed numerous times, and surgery was performed to remove the tumors. It was discovered that Teddy was suffering from a thyroid condition which required simple medication. The first time my wife, Donna, and I saw Teddy, I referred to him as the "Frankenstein" dog since he had large stitches across his head from the tumor. Little did we know how he would steal our hearts. A few months later we agreed to permanently foster him since he seemed happy in our home. For an old dog, Teddy was full of fun, frequently knocking over buckets of toys and chasing tennis balls whenever possible. Through the generosity of the Rescue, Teddy was treated with acupuncture for his arthritis, and lived comfortably for another year and a half. Teddy&apos;s loving nature made him a natural for our fund raising events, where he would allow anyone to pet him. He became a part of our lives that will be sorely missed.